Want to buy the best electric smoker for your needs? After interviewing five professional chefs, speaking to 15 smoking enthusiasts, and reading innumerable online electric smoker reviews, we’ve prepared a list of five top electric smokers on the market. While some of them handle hot smoking, others are designed for cold smoking. Regardless of which you choose, all these food smokers will be enough for your cooking needs. For those of you who do not want to spend over the odds on an electric smoker – but still want it to contain most of the high-end features – the Char-Broil Analog Electric Smoker is a must-have. That said, you’d have to do without a digital display should you choose to purchase this model. 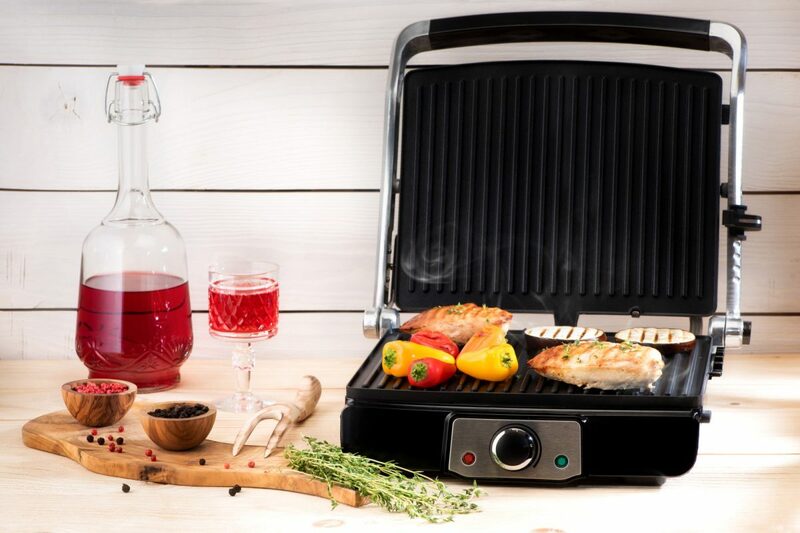 Despite the fact that it comes at a below-average price, the Char-Broil Analog Electric Smoker provides a large number of bells-and-whistles which you normally expect from pricier models. However, since it doesn’t have LED display, we only recommend beginners to go for this unit. First thing first, the Char-Broil provides a cooking space of 544 square inches which contains three-chrome plated cooking grates. And if you want more space, there’s space for an additional plate, though you’d have to purchase it separately. Secondly, making the unit easy to use its front-facing design. That is, be it the water tray, grease cup or wood chip tray, all of them are front-facing. While the water tray prevents meat from drying out, the grease cup allows for easy cleanup. As for the wood chip tray, its large capacity means the unit would require less-frequent refillings. More importantly, this unit offers a convenient temperature adjustment system. It has a 1200-watt heating element which provides this unit with a range of 100 to 400*F. Then there is the door-mounted temperature gauge which lets you easily monitor the internal temperature. What’s more, this unit has three parts which prevent it from losing temperature. They include an insulated cooking chamber, a dual heavy-duty door, and door latches. While the first two help retains temperature through their thickness, the door latches do the same by keeping the door sealed shut. 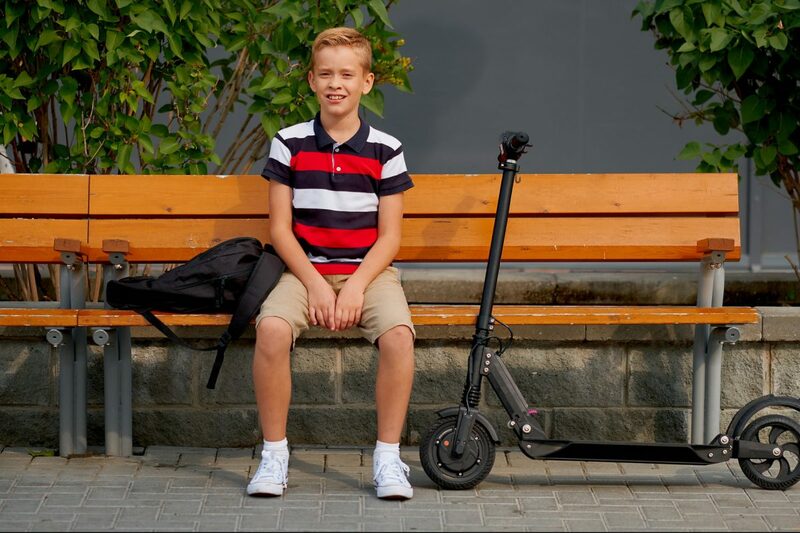 Finally, while the unit doesn’t contain any wheels – which means it isn’t portable – it contains a side-handle using which you can shift it to a minimum distance. Also provided is a one-year warranty on the entire unit. Users have flagged two concerns about this model, the first of which revolves around the absence of LED display which makes the unit difficult to operate in low-light conditions. Also, while it does offer a handle, the absence of wheels adversely affects the portability of this unit. 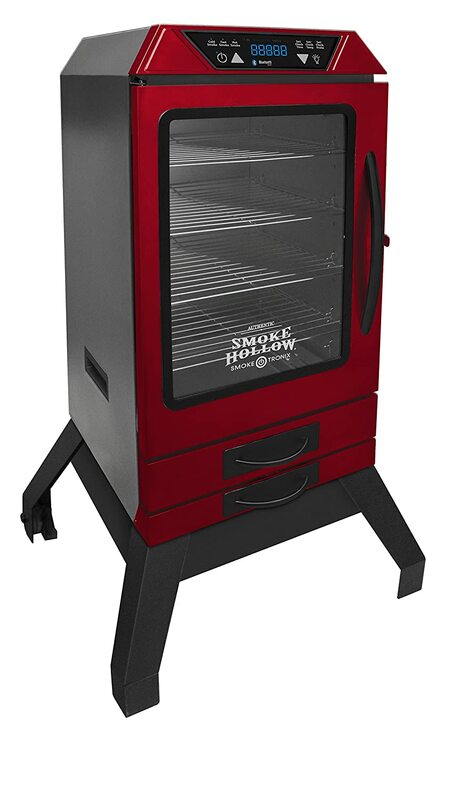 The Smoke Hollow D4015RS 40-inch Digital Smoker offers all the bells and whistles which you expect from premium-priced products. Add to this its Bluetooth-enabled smartphone app, and there is no reason why those affording shouldn’t purchase it. Though costing three times as much as the above-mentioned Char-Broil, the Smoke Hollow justifies its price tag with an impressive feature set. So, if you can afford to pay extra, this model won’t leave you wanting. Starting with its design, the Smoke Hollow D4015RS provides a mammoth 4.5 cubic feet of cooking space. It also includes a built-in LED light which allows you to work in low light conditions. Then there are the four cooking plates which allow you to prepare more food in less time. Look above its glass window, and you’d notice a user-intuitive control panel with a large digital display. The control panel provides you with three smoke options including hot smoke, cold smoke, and fast smoke. It also contains options which let you set/check time, temperature, and probe inside the unit. You can also use it to turn on the LED light inside the unit. More importantly, the whole unit is Bluetooth enabled which means you can control all of its options via your smartphone. All you have to do is to install the app which accompanies the unit, and you won’t have to get up from your couch to adjust the unit’s settings. The range of the Bluetooth falls between 18 and 20 feet through a brick wall. That said, there are a couple of things you might want to note about the unit’s Bluetooth capability. First, at one time, the unit will only connect to one phone. It means you’d have to exit the app if you want any other user to take over. Second, some users have reported that the app occasionally loses connection. Moving on, to make sure the unit retains its preset temperature, it comes with an adjustable latch which you can tighten if needed. It has a front-facing adjustable vent intake using which you can control the wood burn rate of the unit. Finally, making the Smoke Hollow D4015RS a cinch to use is its exterior accessible drip and water trays. The water tray enters/exit the unit through its side, so you won’t have to open the door. Also, while the unit itself doesn’t contain wheels, it is provided with a stand which does have wheels. As suggested earlier, users aren’t happy only one user can control the Smoke Hollow D4015RS through its Bluetooth-enabled app at one time. Our review of the Dyna-Glo DGU732BDE-D 30″ Digital Electric Smoker reveals it as a trustworthy product which delivers what it claims. 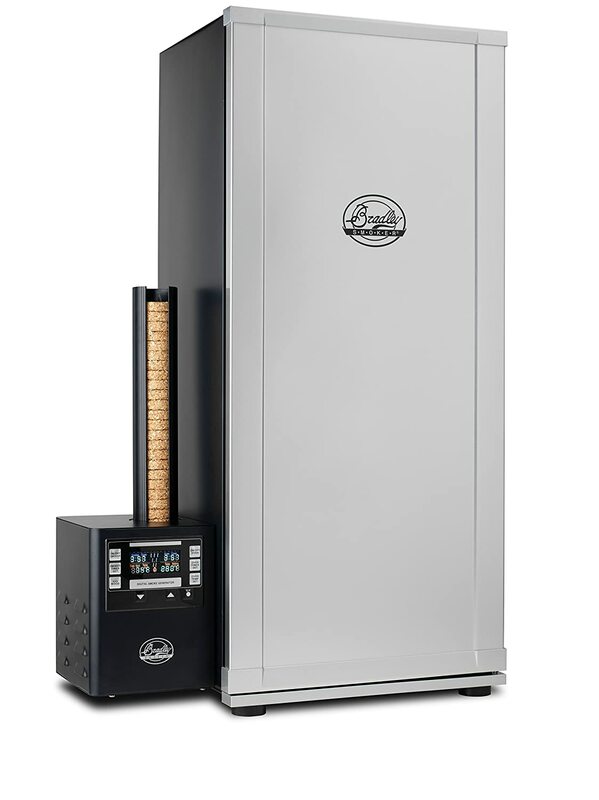 It might be an option for those of you who don’t intend to spend over the odds on a quality smoker. Falling between Char-Broil Analog Smoker and Smoke Hollow Digital Smoker in the price spectrum, the Dyna-Glo provides its users with the best of both worlds. That is, in addition to coming at a competitive price, it provides a considerable number of high-end features. Kicking things off, the Dyna-Glo offers a total cooking space of 732 sq. inches, which is not as high as that of Smoke Hollow but is considerably more than that of the Char-Broil. Making full use of the cooking space on offer are its five cooking plates, the most of any smoker we have reviewed thus far. And positioned beneath the trays is a water-tray to ensure that the meat doesn’t get dry. Glance over its metal door, and you’d notice digital push button controls which simplify the cooking process. They allow you to both monitor and change the cooking time and temperature inside the unit, with the current setting on display on the unit’s easy-to-read digital screen. The Dyna-Glo also has an integrated thermometer which measures the temperature of the food. However, you’d have to manually insert the thermometer into the food for it to function. Also, while you’d be able to see the preset temperature, the unit won’t display its current temperature on the screen. Then there is the side rotor which provides convenient access if/when you want to add wood chips. Still, you may want to note that some users have concerns about the capacity of the chip box, for they claim it could have been bigger. And if you intend to use this unit outdoors, its insulated double-walled firebox door – which is secured by two latches located on the unit’s left side – will make sure to retain its internal temperature. Users claim that since the probe of the Dyna-Glo isn’t detachable, cleaning it isn’t easy. Also, some of them aren’t happy with the size of the chip box, which they claim should have been bigger. Whether you’re an expert willing to discover new recipes or a beginner learning the trade, you can’t go wrong with the Bradley Smoker BTDS76P. It’s easy to use, offers a lot of features, and has a sturdy construction which guarantees its durability. The Bradley Smoker BTDS76P is a mid-range device which is very popular among users and one of Bradley Smoker’s best-selling products. To check whether it’s worth the fuss or not, let’s check its features. Starting with the best this unit has to offer, and its ability to let you control its smoke comes into play. 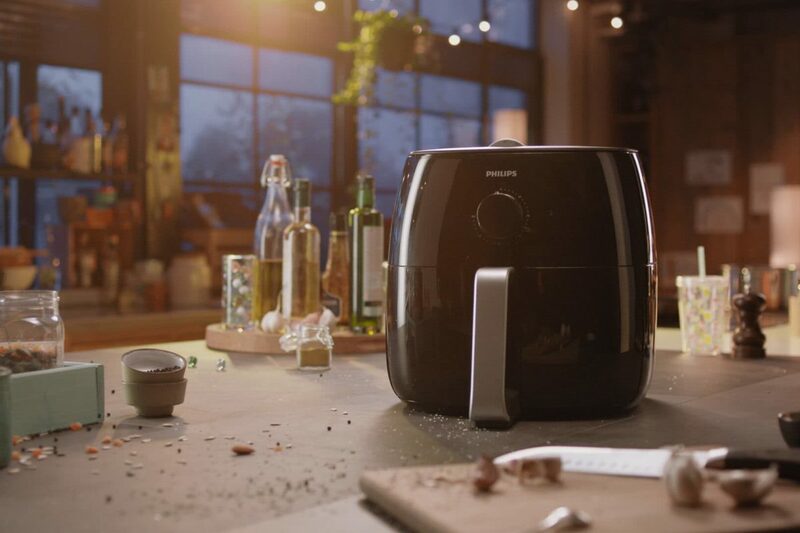 It has a dedicated “Digital Smoke Generator” push-button on its digital controller using which you can increase or decrease the amount of smoke inside the cooking chamber. However, if you’re feeling lazy, the unit will work on its own at pre-determined levels. 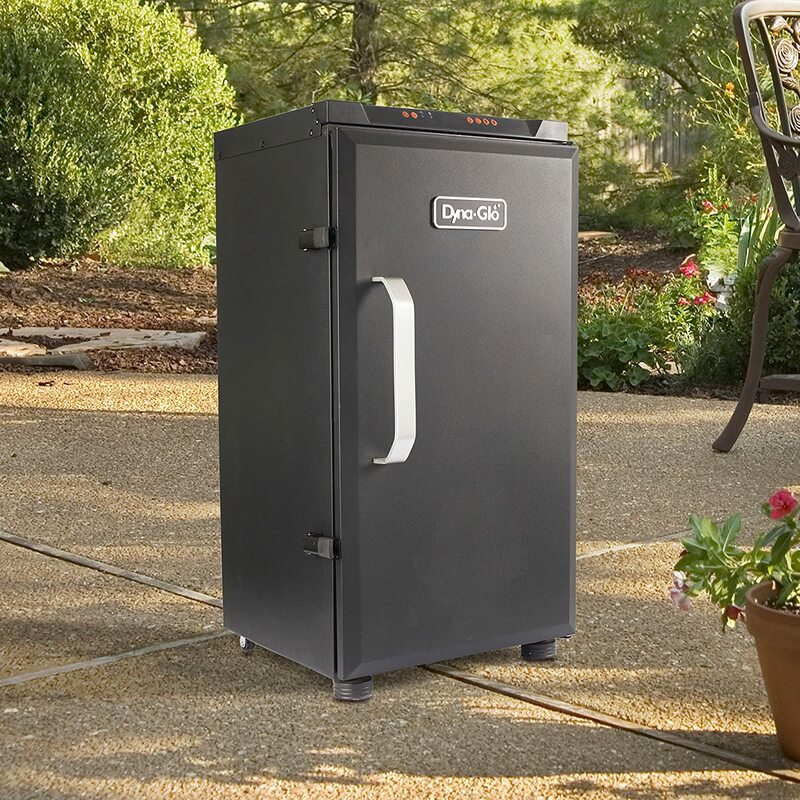 What’s more, in addition to smoke, this digital electric smoker allows you to pre-program it for the next 8 hours. Yes, that’s right, you can leave the unit alone for 8 hours during which it would process your meet to your desired taste. Moving on, Bradley Smoker knew that you’d be using this unit outdoors, hence the reason why they provided it with an epoxy steel construction. Rust-resistant, this coating is able to withstand the fiercest elements of nature. The interior of this unit, meanwhile, has been given a stainless steel coating, which makes it sturdy and durable. And making full use of its spacious interior are four height-adjustable racks. Finally, in case you are wondering, you don’t need to purchase a separate cold smoker as an add-on for this unit. For, it has a cold smoker built into it. All you have to do to activate it is to turn the oven off while leaving the smoker on, which means you’d be adding flavor to the meat without cooking it. Despite the fact that this unit allows you to control its smoke, it produces an incredible amount of smoke even in the lowest setting. It means you can’t use it indoors. 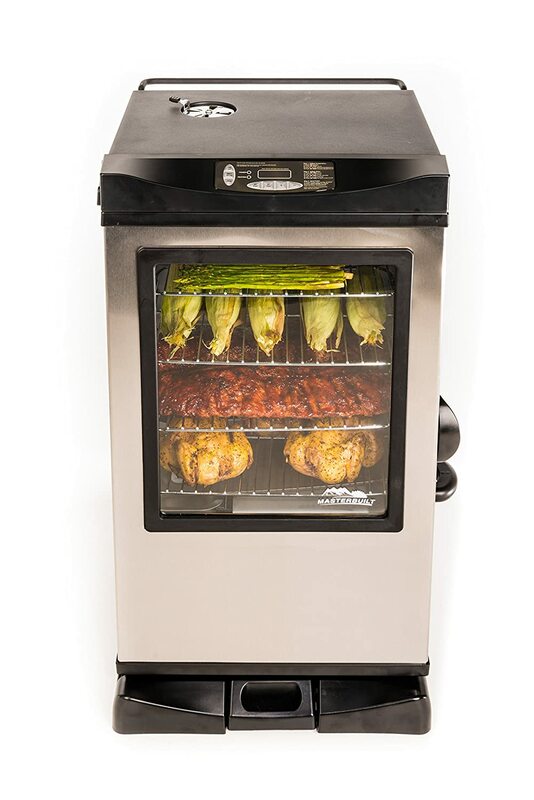 The Masterbuilt 20077515 is an efficient smoker which gets the job done and requires minimum effort from your side thanks to its remote control. Be it smokers, grills, or any other outdoor cooking equipment, Masterbuilt is a name trusted by chefs around the world. To gauge whether or not this model justifies its brand name, let’s turn our attention to its features. The Masterbuilt 2007515 offers 730 sq. inches of cooking space, which makes it the 4th largest smoker in this review. It comes with a stainless coating to prevent rust and its cooking chamber is dotted with 4 cooking racks – all of which are chrome coated to resist rust. Full foam insulation is provided around the 800W heating element to make sure it remains safe to use. Also, it has a blue LED display which allows you to view the indicators of the smoker in both low-light as well as direct sunlight conditions. Its control panel further allows you to set temperature and time inside the cooking chamber. Then there is the light push button pressing which you can turn on the internal light of this smoker. Moving on, the Masterbuilt 2007515 contains a probe which you can insert into the meat to check its temperature. The control panel also has a dedicated probe button pressing which you can see the meat’s temperature on the LED display. However, if you feel that operating the control panel is too troublesome – the Masterbuilt offers an RF remote control in the package. Boasting a solid range of at least 50 feet, the RF remote lets you control and monitor all the functions present on the control panel. Impressively, this digital smoker has an adjustable air damper using which you can control the level of smoke. For instance, if you want mild flavor, you can curtail the smoke level by leaving the damper wide open. Conversely, if you’re after a strong smoky taste, leave the air damper closed. What’s more, you don’t even have to open the door to load the wood chips, as you can just load the tray with them. 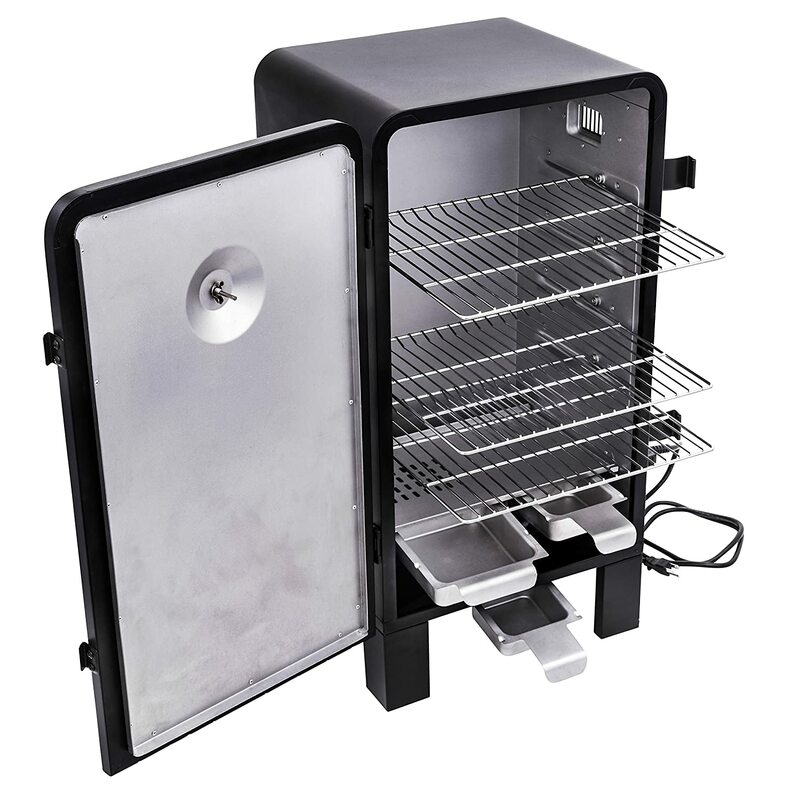 Add to this the bottom mounted drip pan and the back mounted grease pan, and this digital smoker is extra-convenient to use. Once you get some smoke rolling inside the unit, its glass window becomes blurry due to the accumulation of smoke. And with the light on the outside, you cannot see what is happening inside the window. What is it that separates the best electric smokers from the riffraff? As you might guess, cheap electric smokers aren’t bad because they are cheap, instead, they suffer because they lack these below-mentioned features. Since none of us like dry meat, the high-end smokers are equipped with either a water pan or water tray to let the smoked meat retain an adequate amount of moisture. These pans have water which turns into steam on receiving heat from the heating element. Also, if you like, you can use the water pan to add flavor components to your machine. For instance, citrus peel and spices can be added to the water pan to give your meal a unique taste. Nearly all the top electric smokers provide temperature control in the form of the rheostat. It is either available in the form of a knob or digital display. However, merely having a rheostat in your desired smoker isn’t enough. Instead, make sure the rheostat offers adequate temperature range as well. For example, the Masterbuilt 20078715 mentioned above lets you adjust its temperature between 100 and 275 degrees. All the abovementioned features will be of little use without your device having a digital control panel. Apart from being front-facing, a user-intuitive control panel must have LED display for easy use after sunset. Also, it should let you control temperature, time, and on/off mechanism of the unit. As for the RF Remote, it lets you tinker with all the abovementioned features from a distance. In this way, you can easily control the food smoker without getting off your couch. The wood-chip loading mechanism of your device should be such that as to allow you add more chips during cooking without losing heat. That means you shouldn’t have to open the smoker door to add chips. As for the drip-pan, it should be front facing so that you can easily enter/remove it from the unit. Different digital smokers provide the smoke control feature in different ways. While some – like the Bradley Smoker BTDS76P – have a dedicated smoke control button, others provide an air damper whose position you can adjust to regulate the smoke inside the cooking chamber. If you want your meat to have a mild flavor, you might want to operate the smoker at a low smoke level. Conversely, if you want it to develop a strong taste, no amount of smoke is enough. Both of these features serve the same purpose: they make your unit ultra-portable. They are especially useful if you’re purchasing an outdoor smoker as you might have to move it regularly to protect it from the elements of nature. There you have it, five of the best electric smokers in 2019 money can buy. From digital to analog – touchscreen to push-buttons – and manual operation to remote control, we have included all types of electric smokers in this remove. Therefore, if you’re serious about making a purchase, you won’t go back from this page empty handed. However, if you’re still having a difficult time making the selection – and want us to make the selection for you – our vote goes for the Bradley Smoker BTDS76P digital smoker. The major reason we chose this product as the ultimate winner is because it allows you to control the smoke generated inside the cooking chamber with a dedicated button. Also, as stated above, this digital electric smoker allows you to pre-program it for the next 8 hours. What’s more, it also provides a cold smoke option, which means you don’t need to purchase a separate cold smoker for this unit. And guess what, it also lets you give your meat a ‘’wood-smoke’’ smell, as it has a dedicated button which burns the wood chips and relies on their smoke. And since you’d be using this unit outdoors, its epoxy steel construction and stainless steel coating allow it to withstand rust and other elements of nature. That said, if you don’t agree with our choice or feel another product deserves the editor’s choice tag, we’re all ears. Please feel free to give us your suggestions in the comments box.